While kayakers explore Caribbean coves and coastal mangrove lagoons, a very different type of paddling adventure is taking place miles inland. The abundant seasonal rains that fall on the forested slopes of the Cordillera Nombre de Dios Mountains feed the tributaries of the Cangrejal River. As it plummets from the highlands toward the coast, the river sweeps through narrow canyons and rushes over boulder-choked channels that create walls of standing white water. This is one of Central America's premier rafting destinations, where exciting floats lead through the pristine forests of a national park. The word is out, but the river remains uncrowded and untamed. 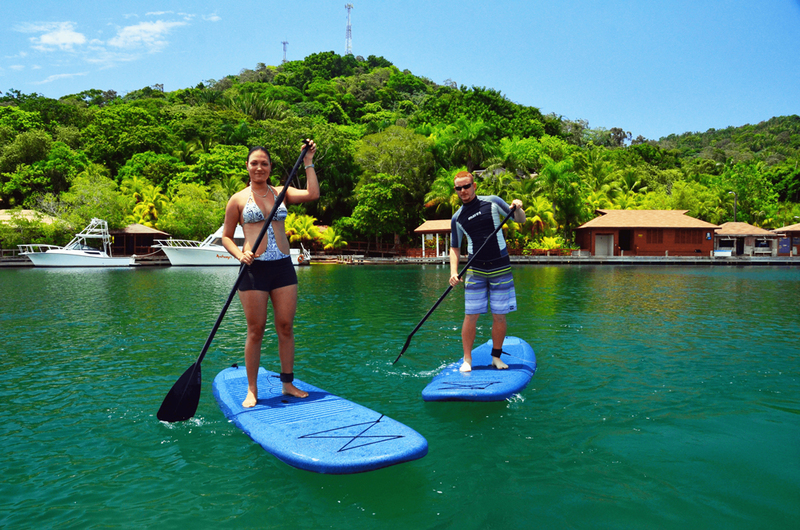 Coastal kayak trips originate both on the Bay Islands and from the Honduran mainland near the town of La Ceiba. Whitewater rafting trips on the Cangrejal River are also staged from La Ceiba, and scheduled as full-day excursions that may include additional stops in the Pico Bonito National Park. You can select trips from mild to wild. Paddlers seeking the ultimate in big whitewater thrills may want to book a trip on the Cangrejal during the rainy season, from September to January. The rapids run year-round, however, and less-intense whitewater trips during the drier season provide opportunities for additional adventures such as cliff jumps and river swims. The La Ceiba River provides class II, III and IV rapids with drops, waterfalls and narrow passages. Tours of El Cacao Lagoon wind through a mangrove forest inhabited by howler monkeys and aquatic birds. Rafting excursions through the Cordillera Nombre de Dios Mountains pass through the 265,000-acre Pico Bonito, which is one of the most biodiverse places on earth. Wear fast-drying clothing that also provides sun protection. Choose shoes that can get wet and deliver good traction on rocks and muddy banks. Stow valuables and electronics in a waterproof bag or case that floats, and use a wrist lanyard to secure cameras when taking photos or videos while afloat. ROATÁN - Turquoise Bay is one of the more exclusive resorts on the island, this is where you come to unwind and get away from it all. Boasting one of Roatan’s only completely private beaches; 500 feet of pristine white sand shores just for you.